Home History How the royals recycle their rocks: As Kate and Camilla both wear historic tiaras to a glittering Palace dinner, fascinating pictures show they are far from the first to do it . How the royals recycle their rocks: As Kate and Camilla both wear historic tiaras to a glittering Palace dinner, fascinating pictures show they are far from the first to do it . The Duchess of Cambridge stepped out this week in the Lover’s Knot tiara, an old favourite of Princess Diana, while Camilla chose the Greville tiara, once owned by the Queen Mother. But as these fascinating photographs show, the royals have been recycling their priceless collection of jewels for centuries. This tiara is perfect for the Duchess of Cambridge, who wore it for the Queen’s annual Diplomatic Reception at Buckingham Palace this week — it’s called the Cambridge Lover’s Knot tiara. 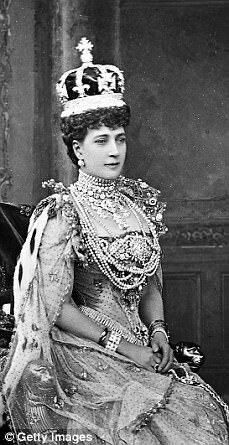 It was commissioned by Queen Mary — wife of George V — from crown jewellers Garrard in 1914, using pearls and diamonds already owned by the Royal Family. It has 19 diamond arches, each framing a pearl pendant. 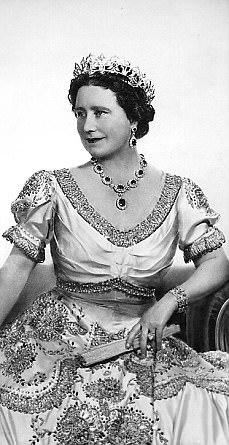 After Mary died in 1953, the tiara passed to the Queen, who wore it several times in the Fifties. In 1981, the Queen loaned the tiara to Princess Diana after her wedding. Diana wore it often at formal events, and it became one of her most iconic looks. The tiara was returned to the Queen after the tragic death of Diana. It was not seen in public again until the Kate wore it to the 2015 Diplomatic Reception. Princess Anne wore this diamond fringe tiara for her marriage to Captain Mark Phillips in 1973, as did the Queen for her wedding in 1947. But Elizabeth wanted this one, which was urgently repaired by Garrard, although there was a visible gap between the central fringe and the spike to the right. The Queen Mary Kokoshnik Tiara was commissioned by Mary in 1919 and is inspired by the ‘kokoshnik’ tiaras worn by the Romanovs before the Russian revolution. 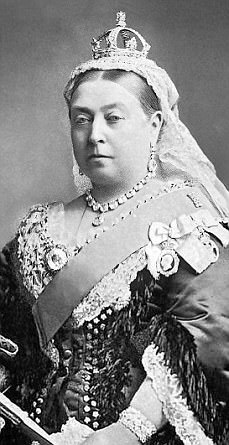 It was fashioned from a necklace given by Queen Victoria. The 488 diamonds are set in gold, with 47 diamond bars and diamond spikes. 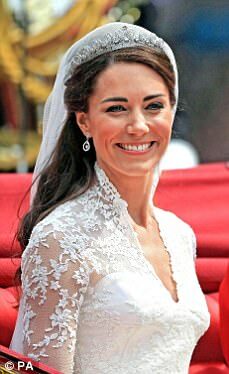 The Duchess of Cambridge is the most recent royal to wear this delicate Cartier Halo tiara as ‘something borrowed’ for her marriage to Prince William in 2011. It was first worn by the Queen Mother when she was still Duchess of York, at a black tie event in 1936. It was designed by Cartier and has 739 brilliant diamonds and 149 baguette-cut diamonds, taking its name from its halo shape. The Queen Mother gave it to her daughter Princess Elizabeth as an 18th birthday present — thought to be her first ever tiara. 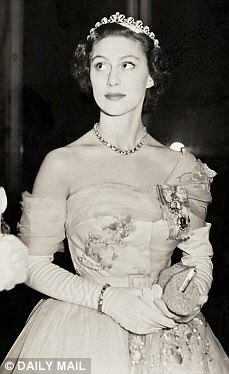 The Queen has never been pictured with it in public, but she lent it to her sister Princess Margaret, who wore it as a young debutante in Paris at the decadent Hertford Hospital Ball in November 1951, where she stayed until past 3am. She chose it when she sat for an official portrait by photographer Cecil Beaton in 1965. 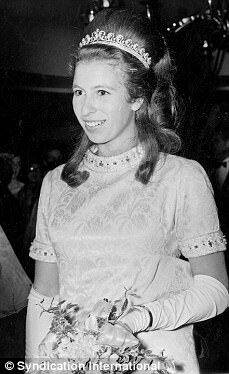 In 1969, Princess Anne wore her hair in a beehive with the tiara at a Gala theatre performance. The Duchess of Cornwall selected the Greville Tiara — on loan from the Queen — for Tuesday night’s Diplomatic Reception. She has worn this diamond tiara many times, including at a Commonwealth Heads of Government dinner in Uganda, in 2007, and the Commonwealth Heads of Government dinner in Sri Lanka in 2013. The tiara, also referred to as the Boucheron tiara, features a honeycomb-pattern design. It was originally made by Boucheron jewellers for British society hostess Margaret Greville in 1921. 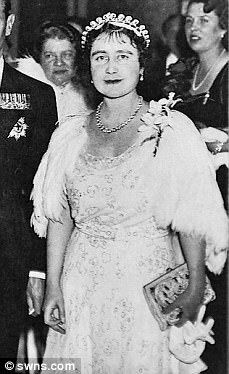 When she died in 1942, Margaret left it to the Queen Mother who altered the tiara, increasing its height and adding a number of brilliant-cut diamonds and a single marquise-cut stone. The Queen Mother wore it at the Royal Opera House in 1986 for a performance called Fanfare For Elizabeth, to celebrate the Queen’s 60th birthday. Queen Victoria’s Bracelet, made with large diamonds, was originally designed for her in 1838 when she was 19. She wore it for the formal set of photographs, taken by Alexander Bassano, to commemorate her Golden Jubilee in 1887. It then passed to her daughter-in-law Queen Alexandra, who wore it to her coronation at Westminster Abbey in 1902. 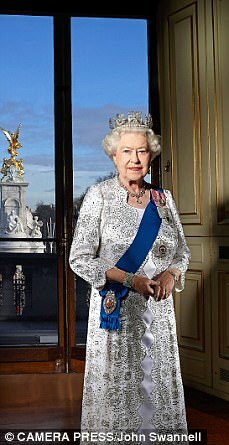 It was bequeathed to Queen Mary, and then to the Queen Mother, who wore it for a formal photograph taken in 1948. When our current Queen inherited the bracelet, she also chose to wear it at her most formal events, including a state visit to Germany in 1965, a visit to Malta in 1967, a state visit to Germany in 1978, and a state banquet in 2012. 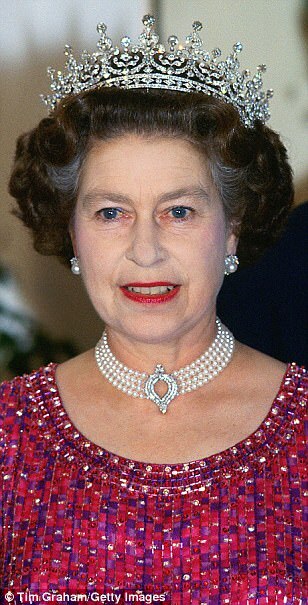 The Queen asked for the Four Row Japanese Pearl Choker to be made from ‘the finest cultured pearls’ which were a gift from the Japanese government. It has four strands of pearls with a central curved diamond clasp. The Queen loaned it to Princess Diana, who loved pearls, for a state visit to the Netherlands in 1982 — one of her first royal engagements a year after her marriage to Prince Charles. 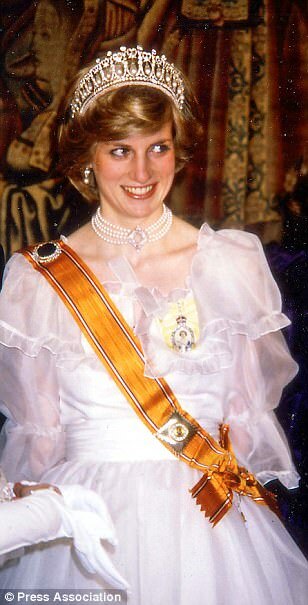 Diana wore it with an orange sash, given to her by the Queen of the Netherlands. The Queen then wore it a year later for an engagement in Bangladesh. The Duchess of Cambridge most recently borrowed the choker for the Queen and Prince Philip’s 70th wedding anniversary dinner at Windsor Castle last month.